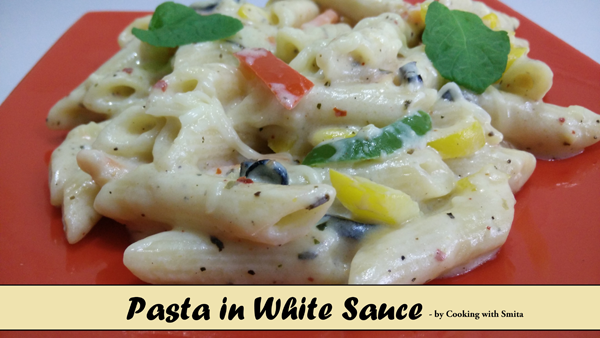 White Sauce Pasta Recipe – An Italian vegetarian dish famous for its creamy delicious taste. Penne pasta cooked and added to stir-fried vegetables with a smooth and creamy white sauce. Add Bay leaves, Black Pepper and ½ onion in Milk. Heat the Milk till it starts boiling. Switch off the gas and strain the Milk in a bowl and keep aside. To make White sauce Heat 3 tbsp Butter in a pan over medium flame. Add 2 tbsp All-purpose flour in melted butter, sauté for 30 – 40 seconds. Lower the flame and add Milk while stirring continuously, mix well and make sure there are no lumps. Boil for 3 – 4 minutes over high flame. Switch off the gas after 4 minutes. Heat 1 tbsp Oil in a pan over medium flame. Add chopped Garlic and sauté for 1 minute. Add Carrots and Capsicum and sauté for another 2 minutes. Add Sweet Corn kernels and sliced Olives, mix well. Add boiled Pasta and sauté for 1 minute. Add white sauce we prepared earlier, add 1 tsp Chilli Flakes, 1 tsp Mixed Herbs, ½ tsp Oregano, add some salt and mix well all ingredients. Cook Pasta in White sauce for 2 minutes. After 2 minutes, add grated Cheese, mix well and switch off gas. Add some grated Cheese, garnish with Basil and serve Hot.